Nikon Coolpix 5400 Manual is aimed to fulfill the needs toward information of both technical or instrumental issue among this digital camera product especially for Nikon Coolpix 5400. Coolpix 5000’s unique wide angle zoom lens, It has been extended to four times optical zoom. This means that the compact Coolpix 5400 has the fairly unique position of being a five megapixel ‘prosumer’ digital camera with a 28 – 116 mm (equiv.) zoom range. The Coolpix 5000 used a 2/3″ (8.8 x 6.6 mm) CCD, the Coolpix 5400 uses a newer (and slightly smaller) 1/1.8″ (7.2 x 5.3 mm) CCD. The Coolpix 5400 also has a few other exposure differences, such as a maximum 10-minute exposure time under the bulb setting option, and a new audio caption recording function. When Nikon Coolpix 5400 was firstly released to the market? How much the price when Nikon Coolpix 5400 firstly released? Nikon Coolpix 5400 is a digital camera produced by Nikon with 5.1 megapixels, 4x optical zoom, 4x digital zoom, and many other functions. It was announced in the end of May 2003. 5.1-megapixel CCD delivering image resolutions as high as 2,592 x 1,944 pixels. Real-image zoom optical viewfinder and 1.5-inch color LCD monitor with swivel design. 4x, Nikkor 5.8-24mm lens, equivalent to a 28-116mm lens on a 35mm camera. Maximum aperture of f/2.8-4.6 depending on zoom setting. Available shutter speeds from 1/4,000-second to 8 seconds, 10 minutes in “bulb” mode. Full Auto, Program AE, Flexible Program AE, Aperture Priority, Shutter Priority, and Manual exposure modes. Eight White Balance modes with a manual setting and a White Balance Bracketing mode. Auto sensitivity or ISO equivalents of 50, 100, 200, and 400. Image Adjustment menu, Sharpness, and Saturation controls. Continuous, High Speed Continuous, Ultra High Speed Continuous, Multi-Shot 16, 5-Shot Buffer, Best Shot Selector, Movie (with sound), and Time Lapse Movie shooting modes. Built-in flash with six settings. Images and movies stored to CompactFlash Type I or II memory cards, or IBM MicroDrive. In the first release, The Nikon Coolpix 5400 pricing set at about $799.00 body-only. Now, if you’re interested to own this compact digital camera device, you can get it in several online stores by paying $30.99 for Nikon Coolpix 5400 5.1 MP Digital Camera with 4x Optical Zoom of the used product. 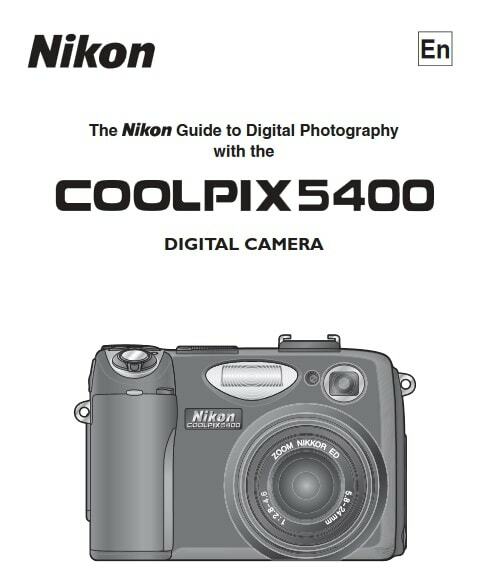 Feel free to download the nikon coolpix 5400 manual user guide at below.